← South Africa’s Sea Pledge Initiative. Wednesday 17th Apr. Outing to CROW. Led by Lesley Frescura and about a dozen members visited CROW (Centre for Rehabilitation of Wildlife) in Yellowwood Park, which is a registered non-profit organisation established in 1980. It aims to rescue, rehabilitate and release wildlife which has either been injured, orphaned or displaced. We were met by the director, Claire Hodgkinson who gave us a slide show presentation informing us of CROW’s mission and how they achieve their objectives. After the presentation we were taken around the holding pens. Claire and Sue informed us how each of the creatures was cared for and their procedures for release back into the wild. Sue then took us into the wild bird hospital which is normally off-limits (for fear of causing additional stress). 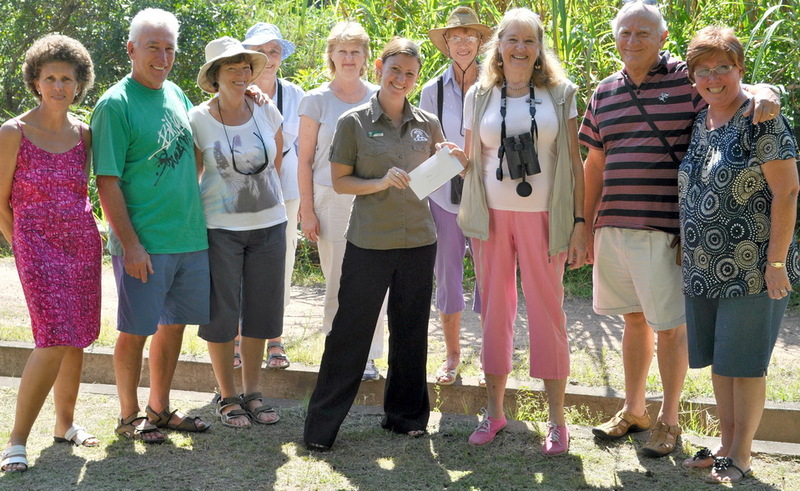 This was followed by tea and cakes and Lesley presented Claire with a cheque for R2000 as a donation from BirdLife Port Natal. See attached picture. They need as much help as we can afford so if you would like to help in any small way please contact Claire. Old blankets, newspaper, ice-cream tubs are a few of the things they need. Cash donations are of course also welcome. Visit their website for more information.